The Premier League and La Liga title races are on course to go down to the wire, with a thrilling story unfolded out in Spain and England. 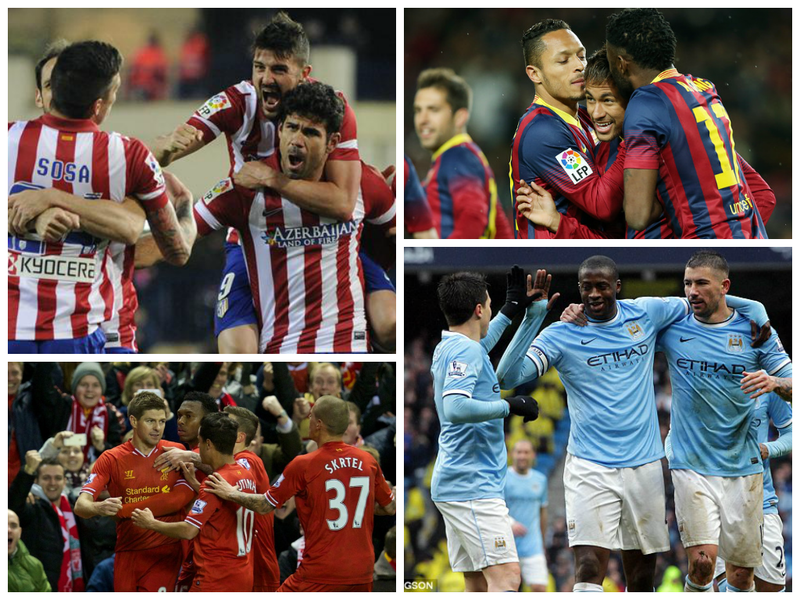 In the remaining fixtures, three big games are set that will arguably determine the title. There are three teams firmly positioned in the title race for the respective leagues. Chelsea, Manchester City and Liverpool jockey for position in the Premier League, while Atletico Madrid keep up with the bigger Spanish giants Barcelona and Real Madrid for La Liga glory. While every game is important, the meetings between each side will be most definitive, considering the hot form that the teams are on. Although, as we know, stunners can come out of nowhere, just look back to Sevilla's win over Real Madrid, handing them back-to-back losses. A tantalizing battle between two of the league's most potent goal machines will deliver plenty of drama in front of a raucous Anfield crowd, one which will undoubtedly have title implications. Sergio Aguero could feature that will make the City tandem all the more ferocious, nicely matching up, though, against Liverpool's star-striking duo of Luis Suarez and Daniel Sturridge, finding incredible success over the past season. Liverpool's biggest problem in the game is their defense. They are most vulnerable to set pieces, as we've seen many-a-time, from the early, out-of-place home loss to Southampton, squandering a place to top the table in the first Merseyside Derby, and as recent as their Anfield win over Sunderland, were they held on for an anxious final fifteen minutes to keep up the pressure. Considering both's form, something will have to give in the game - and that could be Liverpool's defense. Or, low and behold, City have weaknesses. In spite of their vast backlog of attacking resources, in defense at times they can be left vulnerable, maybe not down central like Liverpool, but definitely on the full-backs. Manchester City's full-backs play in more of the wing-back position, pacing forward and sometimes leaving voids at the back - voids that Liverpool could exploit. In addition to their home form and support, it can be a factor. This is going to be one thrilling game of football. Manchester City won the first time round on Boxing Day last year, after Simon Mignolet's mistake to concede Negredo's chip, combined with Vincent Kompany, outweighed Phillipe Coutinho's opener. However, the Reds were left with a bitter sense of injustice as clear cut goal chances were ruled offside - replays suggested otherwise. There's plenty to prove this time round. Not only their certainty from the first tie, but if they can go on to hold up the Premier League trophy this season. Jose Mourinho and Brendan Rogers have had big impacts upon their return, or start of their managerial reign on their respective clubs. Another entertaining encounter, like the one in late December last year, is definitely on the cards. Liverpool's defense will be met up with a much more brittle defense all-round, while midfield prominence on the part of Chelsea could see them through. Samuel Eto'o struck the killer blow to Liverpool in their game last year, but it was the Reds - just like against City - who took the lead early on, but were unable to maintain it throughout the game. Once again, it was entertaining. Both teams matched well, and yet again there were possible arguments for either side's cause of unjust treatment. More to prove, but more lies on the line. Chelsea's midfield, along with Samuel Eto'o who's gradually finding his stride, could prove a tough match for Liverpool - but with Suarez and Sturridge, along with the whole of Liverpool's defense and attack on form, they could have cause for a victory. Liverpool surely will get a win at Anfield at one of the games, its more likely at this one because of Chelsea's attacking weaknesses. Liverpool's current run of form and home record will play a pivotal role in those games. The La Liga title may be decided by one game on the very final day of the season. Now that's one grand occasion. Barcelona won a thrilling Clasico over the weekend to keep up the pressure on the Madrid teams, and Real's slip-up on Wednesday to Sevilla all but aided Atletico to keep atop the La Liga, as they beat Granada. Real Madrid's losses to Atletico Madrid and Barcelona will come to cost them if they finish even. The head-to-head rule in Spain will take them out of the equation. With Real Madrid possibly sitting at third for the tie, although that will fluctuate leading up to the game, this game could be for all the marbles. It will be like a cup final, if it plays out right, how big would that be? Before that, we get two times to build up for the big game in the Champions League Quarter-Finals. There will be two legs of action between league challengers, as one could make ground on another. An interesting tie to say the least. More questions will be answered, but for now we can continue to speculate. Will David Villa be able to spoil Barcelona's party at the Nou Camp - and with Diego Costa on his side, can he keep the form up? Or will Messi's sublime run continue to lift yet another league title? Liverpool's home run will help them in the games and may play a big role, hosting Man City and Chelsea successively at home, along with an away trip in between. As for Atletico Madrid and Barcelona, since their goalless draw in January didn't provide many answers, we can wait till they meet in the Champions League Quarter-Finals for plenty more answers. Three games of big magnitude going into define the Spanish and English football leagues. With thrilling title races unfolding between our eyes, these games are the ones to watch closely. GET INVOLVED with your opinions - which match is the biggest? Use the comments section at the bottom of the article, send us an email, Tweet us your views or post thoughts to our Facbook page.